We know what you’re thinking and yes, Excalibur Dark Knight is indeed the perfect cigar pairing for your favorite superhero franchise! Technically, the theme draws inspiration from Medieval times, so it would also be acceptable to toast this beast up during your next Game of Thrones party. 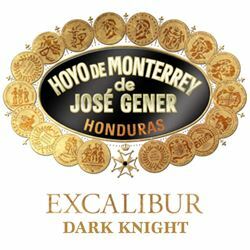 But enough with the similes — Hoyo de Monterrey Excalibur Dark Night is legendary enough to stand on its own! First introduced in the ’70s, the Hoyo Excalibur lineup showcased ultra smooth smoking experiences for the easy-going aficionado. It wasn’t until 2004 that a maduro variety was added with Excalibur 1066 Dark Knight (now known as simply Excalibur Dark Knight); providing a velvety smooth smoking texture and deep, dark, and sweet nuances that have kept maduro fanatics coming back ever since. Crafted in Honduras (as with nearly all Hoyo de Monterrey cigars) at the Honduras American Tabaco S.A. factory, the Dark Knight showcases a Broadleaf-heavy blend. A deep, heavy, Connecticut Broadleaf wrapper sets the tone, securing a similar Connecticut Broadleaf binder and Dominican long-filler tobaccos. This amounts to a syrupy concoction of chocolate, leather, stone fruit, espresso, and nuts — a sweet, smooth, and very satisfying experience for the maduro enthusiast.